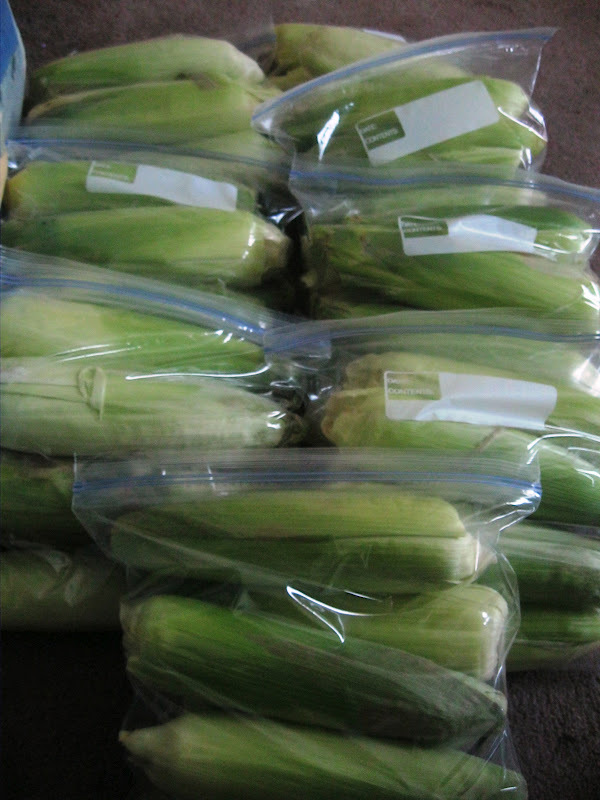 We don't eat a lot of corn, but my little one loves corn chowder and now is a great time to stock up! My husband loves corn chowder. I have his grandmothers recipe, and forgot about it until now, thank you for reminding me! Thanks Jasanna! I'm a Kansas Girl originally, so I know how much corn you've been seeing in Iowa! Thanks for stopping by! 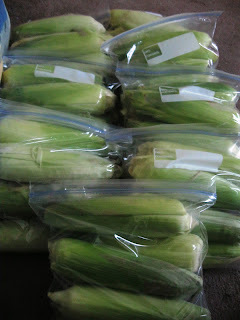 Originally from the Cornhusker State here -- great quick and easy way to freeze corn. Have not tried the oven trick -- will have to add that to my list! Thanks so much for sharing on Busy Monday! Thanks Charlene, I love Pinch of Joy! We put ours on a microwave safe plate, & cook it in the shuck 4 minutes per ear. I don't cook more than 4 ears at a time. When they come out of the microwave use a pot holder because they are very hot. Pull the shucks off and all the silks come right off with the shucks. No mess no fuss. Easy. Love that! Easy Peasy! Thanks for sharing, I am going to try it next time I cook them up! Do you thaw the ears first with this microwave method? Bonnie, I have tried it both ways. I increased the time for it though by an extra 1-2 minutes for the frozen ones and mine came out fine. You may need to just play with your microwave a time or two to get it just right. just tried this (I had to blanch mine) and I was worried because all I had was tin foil to freeze them in... so I decided to try it and prep them the way I would normally so they're all ready to go on the grill out in the oven without having to unwrap for seasoning... success! Thanks! That sounds like a great idea! I love it! Thanks for sharing it, I may just have to try that this year. Hope you have a bountiful harvest! I'd be happy to share it! I'll dig it up out of my recipes and get it to you! 3 slices salt pork cubed small and browned gently. Add salt pork, onions and potatoes to water in pan and cook till tender. Then add 3 cup. milk or cream, 3 Tablespoons butter, 1 or 2 cans cream style corn, salt and pepper to taste. To thicken chowder mix 4 Tablespoons flour with 1/4 cup water and add to soup, stir till thickened. Sorry Bill it's my husbands grandmothers recipe not my grandmother, although I consider her mine too! I often make my own "cream style corn" by cutting the corn off the cobs and then scraping the cobs down really good, getting all that extra starch/pulp out of the cobs . adding in 1/4 cup butter, 1/2 tsp. salt/pepper, cook med. heat for about 1-2 minutes, then add in 1/3- 1/2 cup cream. heat till warmed through. ( I usually then use the remaining cream in my container, mix with milk for the 3 cups in the chowder recipe). Enjoy. ooohhh I should make this one a post too! thanks Bill! 4-5 ears of corn for cream style corn recipe above. Do you thaw before doing your oven method or just pop them in the oven frozen? You didn't specify for the oven method if thawing was necessary and I wanted to make sure I do it properly! Thank you! Great question! I usually cook them up thawed, ,but you certainly can pop them in frozen, just add about 10 more minutes to the oven time! I let mine thaw but the corn was very soft and wet? It had good flavor but not sure of the texture and wetness? Should I try straight to the oven and no thawing? When we lived in Wisconsin I noticed that at some corn feasts,the corn was boiled right in the husks then removed just before serving. 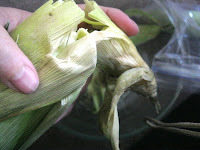 I started doing that and found the corn was tastier and no fuss removing the silk. Can I do that from the frozen state? I don't see why that wouldn't work! It should turn out great, I would bet! If you do this, let us know the results, we'd love to hear! Great tip! Why do you cut off the stalk and tassel before freezing? I have recently discovered microwaving the corn in the husk and I'm eating a LOT of it, it's fresh-picked daily right now here in northern Illinois and totally delicious. That's why I'm looking up how to freeze it! I've been doing one ear at a time in the microwave and three minutes is perfect. Be careful, though, there's no label that says "Caution, escaping steam" or "Warning, corn will be hot." Duh, lol. 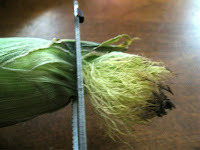 When the corn is cooked I cut off the stalk right at the first row of kernels, making sure to cut through all the husks. Then I hold it up by the tassel and shake it, maybe squeeze a little to squish it out, and it slides out perfect and beautiful, leaving the silk behind in the husk like magic. That's why I want to know why you cut off the top and bottom! 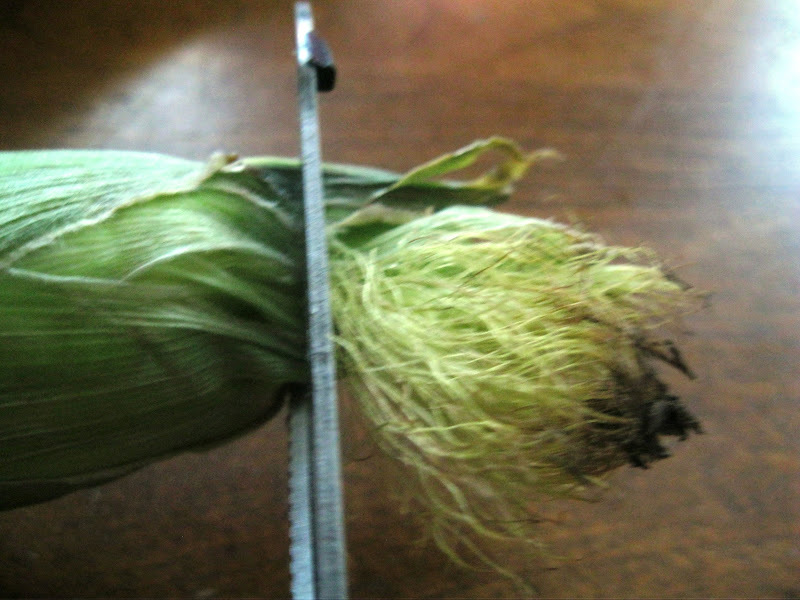 You can leave the top tassel on, and the long stem too! It just cleans it up and makes it all easier to fit into storage bags, and reduces the space used in the freezer by a little bit. In my freezer I need every spare inch I can get! Your method sounds delish! Love it! thanks for sharing your tips! Can you cut off the end rather than snapping it off?? Can the corn be cut off the cob after freezing? I'm going try this. Got some awesome Corn from the farmers market. Yum! Sadly I have not eaten any corn all summer! I did everything as shown and put the ears in a freezer bag. I learned from a corn farmer to microwave corn for about 5 minutes. In the husk it is about 5-6 minutes. Comes out absolutely delicious. I will be buying more corn for freezing before the season is over. Would love to know who thought of freezing corn in the husks...genius. Yum! It sounds easy and delish! I'm wondering what the texture will be like after it is cooked. Most frozen corn feels kind of mushy and the kernels don't pop off into your mouth when you bite it. How does this measure up? I have found that it depends on how quick from "farm to freezer" you get it. 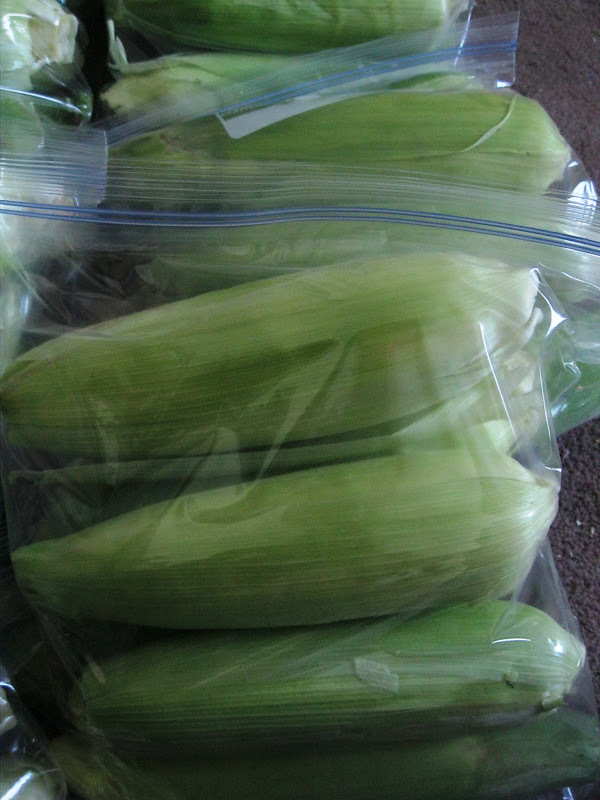 If you get it into the freezer pretty quickly after it's picked it stays pretty close to fresh picked corn when you cook it up (not exactly of course, but not mushy). The older the corn, and the longer you leave it frozen before you cook it and eat, the "mushier" it gets, in my experience. I bought a dozen ears last night from the Farm Market. This is the first time I've frozen the ears in the husk. It took no time at all. I must admit that 3 did not make it to the freezer, and they were absolutely scrumptious! Thank you for the great tips! I'm definitely going to try the oven method after it gets too cold to grill out.